ELP – likened in the Press to the Second Coming. When you consider that Emerson, Lake and Palmer were the first Progressive Supergroup to emerge on the scene in 1970 (Keith Emerson from the then-recently broken up Nice, Carl Palmer from The Crazy World Of Arthur Brown and later, Atomic Rooster and Greg Lake from King Crimson), ushering in the age of Prog-Rock and influencing a veritable mass of musicians, you can understand how hearing the music from tonights post would seem new and interesting and loaded with possibilities at the time. That they became a huge arena band said a lot to encourage the audience to keep an open mind. And in doing so, paved the way for a lot of bands to follow in their footsteps. Although I doubt that, had there not been an ELP, a Genesis might not have existed – they would. It just would have taken them longer to get their message across. It was just that this new complexity and mashing up of Classical, Jazz and Rock held a lot of appeal for people who were looking for something more in their listening experience. They did what they needed to do and they did it remarkably well. Tonight it’s an early session via the Beat Club program from RBB in Germany. A live session from 1970, it catches the band when the songs were new and the energy was high – and this was the period that got everybody’s attention. This was the period the Press almost universally proclaimed them the Second Coming. If you can, try and forget your impression of the band based on their later material. By the time Brain Salad Surgery came around the band was well established, and in some ways, complacent (as a lot of bands get, you will admit) and they played what the audience expected, and well . . . .they were a little over the top. In 1970 no one knew what to expect – they were new and they were heading for uncharted territory. Fun when that happens. Play loud. The audience felt just about the same way. 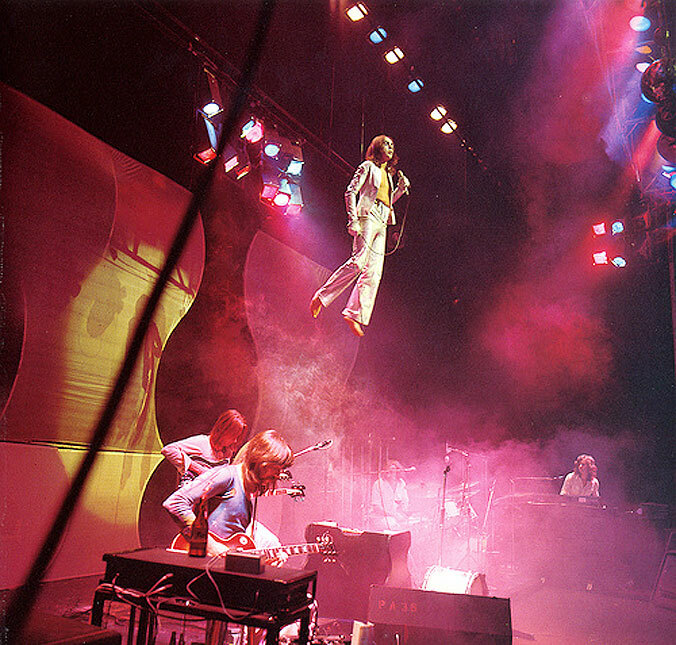 As one of those people who hates saying “oh, you should have been there”, I have to say, if you have just discovered Genesis, and more importantly, Genesis during the Peter Gabriel period, you truly missed some of the best live performances to be given by a band in the mid-1970s. One of the pivotal groups in the Progressive genre of the early 1970s, Genesis were hugely influential on a number of levels. The technical proficiency of the individual players was counter-balanced by the outrageous theatrics of singer Peter Gabriel and took what was ostensively a cerebral exercise and compounded it with a dramatically visual one – it was a totally engrossing experience. There has been a lot of divided opinion over the years, since Gabriel’s departure for a solo career, whether Genesis lost much of their appeal when drummer Phil Collins took over vocal chores and the band took a decided turn for the commercial. I admit to having lost interest. But the bottom line is; if the later incarnation of Genesis got you to discovering them, then there’s a good chance you would dig through their earlier material and find the gems. In any event, here is a concert during the fabled Peter Gabriel period of Genesis, recorded live at Wembley early in 1975 and broadcast by BBC Radio 1’s In Concert Series on July 12, 1975. For those of you just making the discovery, or are interested in a really in-depth look at Genesis, my old pal Armando Gallo, who has chronicled and photographed the band practically from the beginning, has put together a Genesis APP based on his benchmark book I Know What I Like. Check it out and take a plunge into the amazing world of Genesis. Something to look at while you’re listening to this one – at full volume. ELO – diving into some 70s Retro this weekend. Going slightly Retro tonight. A concert by one of the most popular bands of the early 1970s, and certainly one of the most successful from that decade. 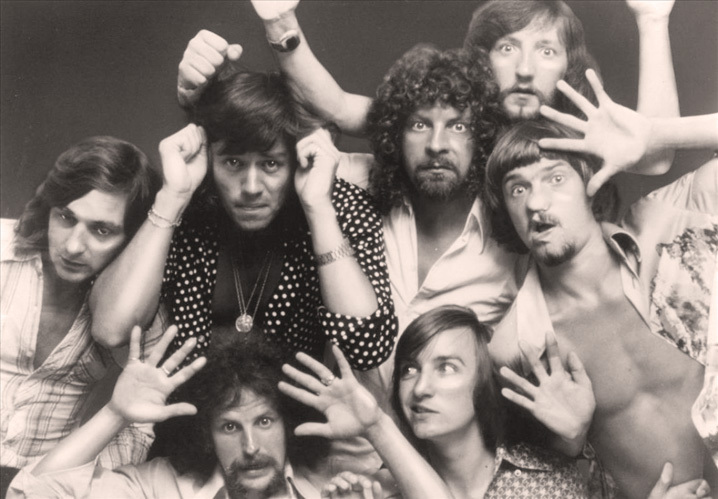 The Electric Light Orchestra (ELO) began life from the wreckage of The Move, which featured ELO founding members Roy Wood, Jeff Lynne and drummer Bev Bevan. Roy Wood would soon leave the band to go on his own adventure with Wizard, but the seeds of a new sound were well-underway. With the extra bonus of cellos in the mix and an approach more akin to Progressive Rock at the time, ELO gained a reputation the good old fashioned way; they toured almost constantly for a couple of years, most notably in the U.S. which they were determined to crack no matter what it took. So the band criss-crossed the U.S. and repeated the process until they became a household name and prominent features on FM. Despite that, they were still pretty much ignored in their native UK. It wasn’t until later in 1976 when A New World Record was released that the band managed to match their success in the UK that they had in the U.S. This weekend it’s a concert from that UK breakout period of 1976. The band had undergone some personnel changes and by this time they had successfully crossed over into the mainstream market. This concert, recorded on November 6, 1976 features material mostly culled from their release A New World Record. In case you forgot what the 70s sounded like . . . .